BILL FARRELL (Tom Tryon), returning home from his bachelor party, is grasped suddenly by a grotesque, unearthly hand and enveloped in a heavy black smoke. The next day, acting a little strange, he is married to Marge (Gloria Talbott). On their wedding night a brilliant flash of light-fling makes Bill's face almost transparent, reveals the hideous features of a monster. A year passes and there is suspicious tension between Marge and Bill. One night, horror-stricken, she secretly watches Bill change into a monster and enter a hidden space ship in a nearby woods. There are other terrifying incidents and sudden death as the aliens silently take over the town's police, telephone and telegraph offices. Marge tells her story to Dr. Wayne (Ken Lynch). He leads an armed group to the space ship area. Two monsters appear and there is a terrific battle until they are killed by two hunting dogs. Inside the space ship, the men find the unconscious humans taken over by the monsters, their bodies wired electrically so as to transmit forms, desires, memories to their outer-space counterparts. The men start disconnecting the circuits. Bill, after threatening Marge with physical violence, rushes to the battle with two policemen-monsters. Marge follows, runs into him there. As his electrical circuit is cut, he moans with pain. His human features slowly melt away, the monster features become visible and then they, too, disintegrate into a gelatin-like mass. The real Bill, revived and unhurt, leaves the space ship and embraces Marge. 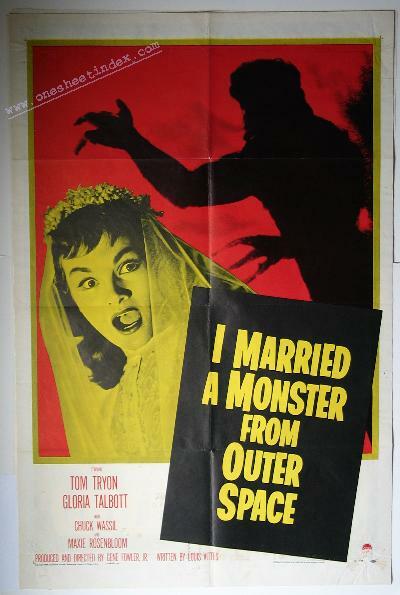 I Married a Monster from Outer Space, the 1958 Gene Fowler Jr. romantic science fiction horror thriller starring Tom Tryon, Gloria Talbott, Chuck Wassil, Max 'Slapsie Maxie' Rosenbloom (a professional boxer who appeared in several movies), and Peter Baldwin.